Model AB Automatic Balancing Valve is a combination ball valve, automatic flow control device and union. The removable flow cartridge is factory set to automatically limit the GPM to within +5% of the specified flow. 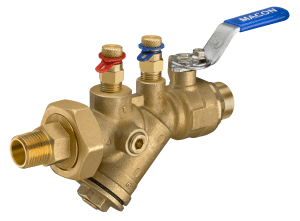 The ball valve has a chrome plated ball, Teflon seats and a blowout proof stem with double EPDM O-ring seals. The union has an EPDM O-ring seal and tailpiece available in MNPT, FNPT, and SWT end connections. Standard features include Memory Stop and Dual Pressure / Temperature Ports.